(b) The Prince issues orders that notice of the meeting shall be given to the persons concerned. (c) The high steward then apprises those among the officials who are to take part in the shooting-match. (d) The captain of the archers apprises the ducal and ordinary ministers and great officers, and the warden of the ordinary officers does the same for them and their subordinates. (e) Three days before the meeting the high steward forewarns the master-at-arms and the captain of archers to see to the cleaning up the night before the contest. (a) The master-at-arms commands the measurers to lay out the shooting-range, and the positions in which the screens are to be set up. The measurers use the measure called the " fox's stride," and lay out the range 1 as follows : for the great target 2 ninety strides, seventy for the medium, 3 and fifty for the small target made of tapir skin. Each screen is set ten strides west and ten north of its target. (b) Then he orders the measurers and the officer in charge of the curtained chariots 4 to stretch the three targets. Because of its height, the great target shows its ''swan" 5 over the top of the second, and the '' swan " of the second is visible over the top of the smallest. The lower edge of this last is a foot off the ground. None of the lower left braces are fastened. The screens are then set ten strides west and ten north of their targets, and are all made of hide. 3. Suspending the Musical Instruments. (a) On the eve of the shooting, the officials of the music department suspend the bells and musical stones to the east of the east stairs. The set 6 of stones to accompany the organs is played with the striking faces west, and to the south of them the bells used for the same purpose, with the small bells to the south of these again, all set out in lines south- ward. (b) A stand-drum'' is placed to the west of the east steps, with the tympan to the south, and a responding- drum to the east of it, its tympan facing in the same direction. (c) On the west of the west steps are placed the stones that accompany the singing, with their striking faces eastward. To the south of them are the great bells, and south of these again the smaller bells, all laid out in lines southward. A stand-drum is set to the south of these with its tympan facing west, and a leading-drum 7 to the north of that. (d) Another stand-drum is placed east of the west steps, with its tympan to the south. (e) The great flute is laid between the two stand- drums. (f) The finger-drum is leant against the western stay of the frame for the stones that accompany the singing. (a) At early dawn the keeper of the sacrificial vessels sets the wine-holders to the west of the east pillar. The ordinary holder consists of two square-mouthed vases, and the Duke's holder of two earthenware jars to the north of them, all being on stands. The covers are of cloth, coarse or fine, according to the season, stretched on lengths of small bamboo, and laid over the mouths of the vessels. On these the ladles are laid inverted. One each of the pairs of vessels contains "dark wine," while the other, with ordinary wine in it, is laid to the north. (b) The wine-holder for the general pledging of the officers is set to the south of the western smaller bells, facing north, and consisting of two round-necked vases. (c) The other wine-holder is placed to the north- east of the screen belonging to the great target, and consists of a pair of vases to hold the wine presented to the markers at their targets. (d) The used- water jar is set to the south-east of the east steps, with a jar of water to the east of it, and the cup-basket to the west, all facing fairly south. The Duke's cup-basket is laid to the north of this, and faces west. (e) Another used-water jar is set to the north-west of the marker's wine-holder, with water to the north of it, and the cup-basket to the south, and all facing squarely east. sets the guest's mat to the west of the room door, and facing south, it being in two layers. The mat for the ministers is to the west of the guest's mat, and with its head to the east. The mats for the great officers follow on these, with their heads also to the east ; while if any face the east, the head of the mat is laid to the north. The mats for the musicians are laid to the east of the west steps, with their heads to the east, and for the Duke's to the west of the east steps, facing north, and with their heads also to the east. (g) The viands are prepared for the various officials according to their rank. 5. Going to Their Places. (a) When the meat is ready, the captain of the archers announces to the Duke that all is ready, and he ascends the steps and goes to his place on his mat, facing west. The head retainer meets the ducal and ordinary ministers and great officers, who all enter by the right of the door, and stand facing north, and graded from the east. The ordinary officers take their places on the west side, facing east, and graded from the north. The senior recorders stand to the north- east of the smallest target, facing north, and graded from the east. To the south of the officers are those who take part in the general feasting, facing north, and graded from the east. The assistants of the head retainer stand below the eastern side hall, facing south, and graded from the west. and grade from the north. The Duke salutes the great officers, who, together, advance a little. (a) The head director of archery acts as usher. (b) As such, he asks the Duke to name the principal guest, and he replies : " Command So-and-so to accept this office." The usher then commands the person named to assume the office, and he, advancing a little, formally declines, this being reported to the Duke. The usher then commands him a second time, and the guest, with two kowtows, accepts ; whereupon the usher reports his acceptance, and the guest goes out the door, and stands there, facing north. (c) Then the Duke salutes the ducal and ordinary ministers and great officers, and they ascend and go to their mats. A retainer stands at the foot of the eastern steps, facing north, and invites the Duke to name the cover-holders and the man who shall serve the viands to him. (d) The Duke then names the cover-holders, and they ascend the western steps and stand to the south of the wine-holder, facing north, and graded from the east ; while the court steward asks the Duke to name the men who shall serve the Dukes and great officers. 7. The Entrance of the Principal Guest. (a) The usher meets the principal guest, and when he reaches the court, the Duke descends one step and salutes him. The guest draws aside, and the Duke ascends again and goes to his mat. (b) Then the Ssu Hsia 9 is played. The guest ascends by the western steps, followed by the Master of Ceremonies, who takes his stand to the right of the guest, with his face to the north, and bows twice, the guest responding with two bows. 9. The Master of Ceremonies Offers Wine to the Guest. (a) The Master of Ceremonies descends to wash a goblet, and, at the south of the used-water jar, faces north-west. The guest descends and stands to the west of the western steps, facing east. The Master of Ceremonies declines the honour of his descending, and the guest replies suitably. Then the Master of Ceremonies, facing north, washes his hands, and, sitting down, takes the drinking-cup, rises and washes it, the guest withdrawing a little, and declining the honour of the washing. Then the Master of Ceremonies sits down, lays the cup in the cup-basket, rises and replies. After this the guest returns to his place and when the Master of Ceremonies has finished washing his cup, the guest salutes and ascends, the Master of Ceremonies going up also. (h) Then the guest bows in acknowledgment of the washing, and the Master of Ceremonies, at the guest's right, lays down the cup and replies with a bow. He then goes down to wash his hands, and the guest descends, the Master of Ceremonies declining the honour, and the guest replying. When the washing is complete, the guest salutes and ascends. The host then ascends, sits down, and takes the drinking-cup. Then the cover-holder lifts the cover, and the Master of Ceremonies ladles out a cupful from the Duke's holder, after which the cover-holder puts on the cover, and the ladler sets on the ladles and inverts them. (c) Then the Master of Ceremonies offers the wine to the guest in front of his mat, and the guest, at the top of the western steps, bows, and, going to the front of the mat, accepts the cup and returns to his place, the Master of Ceremonies, at the guest's right, bowing as he invites him to drink. (d) The under-steward brings forward the relishes. (e) Then the principal guest ascends his mat, and the cadets 10 set out the stand with the dismembered joints. (g) Then the guest sits down at the top of the western steps, with his face to the north, and finishes the cup, rises, sits again, and, laying down the cup, bows. He then takes the cup and rises, the Master of Ceremonies responding with a bow. lo. The Principal Guest Toasts the Host. west of the western steps, facing east, advancing a little and responding suitably. (b) The guest sits, takes the cup, places it at the foot of the cup-basket, washes his hands and then the cup, the Master of Ceremonies declining the honour. The guest sits, lays the cup in the basket, rises, replies, finishes the washing, and then, when he reaches the steps, salutes and ascends, the Master of Ceremonies ascending also, and bowing in acknowledgment of the washing with ceremonial similar to that used by the guest in like circumstances. The guest then descends and washes his hands, the Master of Ceremonies descending also, and the guest declining the honour. When the washing is finished, they salute and ascend, and the guest ladles out a cupful from the Duke's holder, the cover-holders acting as before. Then the guest takes the cup to the top of the west steps to toast the Master of Ceremonies, and the latter, facing north, bows as he receives the cup, the guest, at his left hand, bowing and inviting him to drink. (c) The Master of Ceremonies sits and pours a libation, but neither sips the wine nor bows in acknowledgment of its quality. (d) Then he finishes the cup, rises, sits, lays down the cup and bows, takes it again and rises, the guest responding with a bow. The Master of Ceremonies does not bow in acknowledgment of the honour done to the wine, and, taking the empty cup, descends and places it in the basket. (e) The guest then descends and stands to the west of the west steps, with his face eastward. (f) Then the usher communicates to the guest the Duke's command that he shall ascend the steps. He obeys, and, ascending, stands at the end of the western inner wall, with his face to the east. 11 . The Master of Ceremonies Offers Wine to the Duke. (c) Then the Master of Ceremonies goes round by the west steps, and, standing at the foot of the eastern steps, bows, inviting the Duke to drink. The assistant steward brings forward the relishes from the left chamber, and the cadets set out the meat-stand, going up by the western steps. (d) The Duke makes the offering as the principal guest did, the cadet assisting by handing him the lung. (f) The Master of Ceremonies ascends and receives the cup, descends and places the cup in the Duke's cup-basket. 12. The Master of Ceremonies Toasts Himself. (a) The Master of Ceremonies then changes the cup, and, after washing it, ascends and ladles out wine from the ordinary holder. Then he takes it down to drink a toast at the foot of the eastern steps. Sitting down, with his face to the north, and laying down the cup, he kowtows twice, the Duke replying with two bows. pouring a libation, finishes the cup, rises, sits, lays down the cup, and kowtows twice, the Duke replying with two bows, after which the Master of Ceremonies lays the cup in the cup-basket. 13. The Master of Ceremonies Pledges the Principal Guest. (a) The Master of Ceremonies washes his hands and the cup, goes up the steps, and raises it to the principal guest. Then he ladles out wine from the ordinary wine-holder, and, sitting at the top of the west steps, lays it down and bows. The guest, at the top of the west steps, faces north and bows in reply. The Master of Ceremonies then sits, pours a libation, and forthwith drinks, the guest declining the honour of being pledged. When he finishes the cup, he rises, sits, lays down the cup and bows, takes the cup and rises, the guest responding with a bow. (b) Then the Master of Ceremonies descends to wash the cup, the guest descending also, and the Master of Ceremonies declining the honour of his descent, while the guest declines the honour of the washing. When the washing is complete, the guest salutes and ascends, but does not bow in acknowledgment of the washing. The Master of Ceremonies then ladles out wine from the Duke's holder, and the guest, at the top of the western steps, bows, and, receiving the cup in front of his mat, returns to his place, the Master of Ceremonies bowing as he invites him to drink. Then the guest goes on to his mat, pours a libation, and places the cup to the east of the relishes. The Master of Ceremonies then descends and returns to his place, the guest leaving his mat, and standing to the west of it, with his face to the south-east. 14. Raising the Goblet to the Duke. (a) A retainer, from the foot of the eastern steps, asks the Duke to name the cup-raisers. He commands that the seniors shall do it, so the retainer brings two seniors of the lower grade of great officers to raise the cup. (b) The cup-raisers, at the foot of the eastern steps, together turn north and kowtow twice, the Duke responding with two bows. Then they take their stand to the south of the used-water jar, facing west and graded from the north. Advancing in turn, they wash their hands and the horn goblets, then go up by the western steps, advance in turn, and ladle wine from the ordinary holder. Meeting at the north of the western pillar, they go down, and, coming to the foot of the eastern steps, lay down their goblets and kowtow twice. Then they take the goblets and rise, the Duke responding with two bows. Both the cup-raisers sit and pour a libation, finish off the goblets, rise, sit, lay down the goblets, kowtow twice, take the goblets, and rise, the Duke replying with two bows. Then the cup-raisers take the goblets and stand to attention, to the south of the water-jar. kowtow twice, inviting the Duke to drink, the Duke replying with two bows. (d) Then the cup-bearers retire together and go to their places. 15. The Duke Begins the General Pledging for the Guests. (a) The Duke sits, takes a goblet raised by the cup-raisers, and, rising, pledges the principal guest. He descends, and, at the foot of the western steps, kowtows twice, the head retainer declining the honour for the Duke, and the guest going up the steps and completing his obeisance. (b) The Duke sits down, lays down the goblet, and replies with a bow, takes the goblet, and rises. He then finishes off the goblet, the guest going down the steps and bowing, while the head retainer declines the honour for the Duke, and the guest ascends and kowtows twice. (c) The Duke then sits, lays down the goblet and bows in reply, takes the goblet and rises. The guest goes forward, and, receiving the empty goblet, descends and lays it in the cup-basket. (d) He changes the goblet for an ordinary one, rises and washes it. (e) But if the Duke commands him not to do so, he does not change the goblet or wash it, and, returning, ascends and ladles out wine from the Duke's holder, then goes down and bows, the head retainer declining the honour for the Duke, and the guest, going up the steps and kowtowing twice, the Duke replying with a bow. (f) Then the guest communicates to the usher his desire that he shall ask permission for him to pledge all the officials of the court, and this the usher communicates to the Duke, who gives his consent. (g) The guest then takes the cup to pledge the great officers in turn at the head of the western steps. The usher calls on the senior among them to ascend the steps and accept the pledge. The guest, going to the right of the great officer, sits, lays down the goblet and bows, takes it and rises, the great officer responding with a bow. The guest then sits and pours a libation, stands and finishes the goblet, but does not bow. If it be the Duke's goblet, the guest goes down, changes it for another, which he washes^ ascends and fills it at the ordinary wine-holder, the great officer bowing as he receives it, while the guest bows, asking him to drink, and then returns to his mat. (h) The great officers all receive the pledge in turn, with the same ceremonial as that with which they received it from the principal guest. They do not pour a libation of the wine, and the last to receive the pledge takes the empty goblet down, lays it in the cup-basket, and returns to his place. 16. The Master of Ceremonies Offers Wine to the Ducal and Ordinary Ministers . (a) The Master of Ceremonies washes a drinking- cup, and, ascending, fills it at the ordinary holder and offers it to the ministers at the top of the western steps. The keeper of the sacrificial vessels rolls together a double mat and sets it out to the left of the principal guest, with its head to the east. (b) The minister ascends, and, bowing, receives the drinking-cup. The Master of Ceremonies bows as he asks him to drink. The minister declines the honour of the double mat, and the keeper of the vessels removes it. Then the relishes are brought in, and the minister ascends his mat, the cadets setting out the stand of dismembered joints. (c) The minister then sits, grasps the cup with his left hand, and makes an offering of the relishes with his right, then lays the cup to the right of the relishes, rises, takes the lung, sits, cuts off the end and offers, but does not taste it. Then he rises and puts it on the stand, sits, wipes his hands, takes the cup, and pours a libation. He takes the cup, rises, and goes down from his mat. He goes to the top of the western steps, faces north, sits, finishes the cup, rises, sits, lays down the cup and bows, takes it again and rises. (d) Then the Master of Ceremonies returns his bow and receives the cup, the minister going down and returning to his place. (e) When the ministers have all been pledged, the Master of Ceremonies takes the empty cup down and places it in the cup-basket. Then the usher calls on the ministers to go up, and they all ascend and go to their mats. (f) Vide XI., 14, g and h.
17. The Second Raising of the Goblet to the Duke. Vide XI., 15. 19. The Master of Ceremonies Offers Wine to the Great Officers. 20. The Musicians Sing, and the Flute-Players Play in the Court. (a) Then they lay mats for the musicians at the top of the west steps, and a little to the east. A retainer meets the musicians, six in all, with four lutes. (b) The head of the slaves, empty-handed, leads along the director of music, and his first assistant leads the assistant director, while one of the ordinary slaves leads the first musician. (c) Vide VI., 13, h.
(d) Those following the director are also led along by their guides, empty-handed. (e) When they enter, the under bandmaster follows them. (f) and (g). Vide VI., 13, c, but with a little less detail. (h) The assistant bandmaster stands at the east of the western steps. (i) Then they sing the three " Call of the deer " pieces. (j), (k), and (l). Vide VI., 13, e, f, and g.
(m) The musicians, as a whole, do not bow when accepting the cup, but remain seated, pour a libation, and drink off the cup. Relishes are served to them all, and they make no offering of them. The Master of Ceremonies receives the cup, and, descending, places it in the cup-basket and returns to his place. (n) Then the principal and second musicians and the first performer descend together and stand to the north of the drums. The rest of the musicians are arranged in two lines behind them. (0) Then the great flute plays " The new palace " suite of three pieces. second musician and the first performer cross over and take their seats to the south-east of the eastern cupboard, 14 facing west, and graded from the north. 21. Appointing the Over seer. (a) Vide XII., 4, a, the person here being the usher, and there the captain of the archers. (h) Vide XII., 4, h, except that the principal guest and Dukes are here added to those addressed. (c) The overseer then descends by the western steps, and, facing south, sits and takes the goblet, goes up, ladles wine out of the ordinary wine-holder, descends, faces south, sits, lays down the goblet, gets up, turns round by the right, faces north, and stands in an expectant attitude. He then sits, takes the goblet, rises, sits again, does not pour a libation, finishes the goblet, lays it down, rises, kowtows twice, turns round by the left, faces south, sits, takes the goblet, washes it, faces south, and again puts the goblet in its place and stands, facing north. 22. The Invitation to Shoot. (a) The director of archery goes to the dressing- tent, and, baring his left arm, puts on the finger-stall and armlet, and takes up his bow, laying his set of arrows across it on the outer side, so that their points appear at the bow hold, while with his right thumb he hooks the bow-string. (b) Then, from the front of the east steps, he says : "The master-at-arms invites you to shoot." (c) He announces that great officers will pair with great officers, and that if an ordinary officer is paired with a great officer, he will take the second place. 23, Presenting the Shooting Weapons and Drawing the Marks. (a) The director then goes to the front of the west steps, and, facing east, looks to the right and commands the assistants to present the shooting weapons. 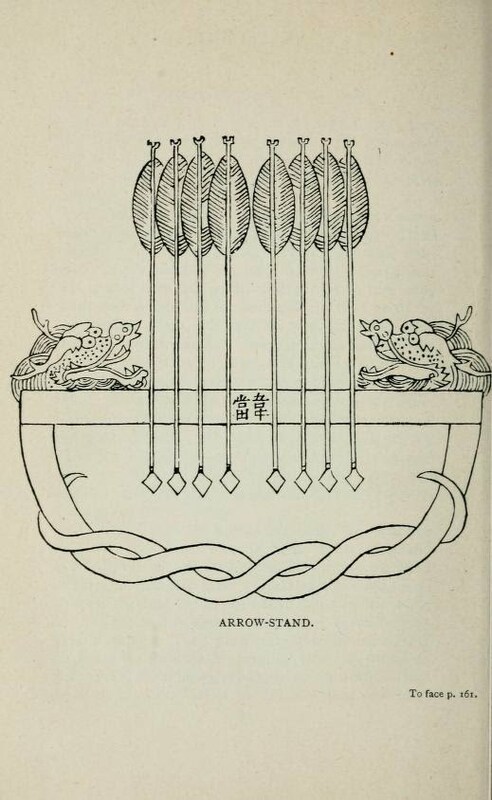 (b) These are then brought in, the Prince's bow and arrows being placed in the eastern hall, and the guest's bow and arrows, along with the tally-holder, tallies, and cup-stand, 15 below the west hall. The bows and arrows of the body of shooters are not gathered up separately, but all, along with the arrow-stand, are taken to the dressing-tent 16 and left in readiness. (c) The workmen, employees, and measurers go up by the north stairs, 17 and between the pillars measure the distance with a bow. They use red or black, and, regulating the measurements with a foot-rule, draw the cruciform shooting marks, the superintendent of archery supervising them. (d) When the marks are drawn, the men go down by the northern steps, and the keeper of the vessels sweeps the marks and goes down the same way. 24. Instructing the Recorder and Arranging the Couples. (a) The great recorder stands to the west of where the tally-holder is to be placed, and faces east to receive the regulations. (b) Then the director of archery faces west and instructs him as follows : " The Duke shoots at the great target, the great officers at the medium, and the ordinary officers at the target of tapir's hide. The shot that does not hit the proper target is not counted. A man of lower and one of higher standing, form a couple and shoot at the same target." The great recorder signifies his acceptance of the terms. (c) Whereupon they tell off the three sets of competitors, who then take their stand in readiness to the north of the dressing-tent, facing west, and graded from the north. (d) Then the director of archery says to the first shots : '' So-and-so will wait on your honour." To the second shots he says: "Your honour will shoot with So-and-so." (e) When he has gone through them all, he commands the three couples to take their bows and arrows from the dressing-tent. 25. Demonstrating the Art of Shooting. (a) The director enters the dressing-tent, and, putting three arrows into his belt, fits one on his bow. (b) Then, having gone out, he salutes, with his face to the west, and, when he gets abreast of the stair, he faces north and salutes again, and again as he reaches the stair, and once more as he reaches the hall. When he gets abreast of his mark, he faces north and salutes, and again when he reaches his mark. Then he with- draws a little from the lower mark 18 and demonstrates the art of shooting. (c) He shoots at the three targets with his set of arrows, first loosing at the tapir hide target, then at the centre one, and, lastly, loosing twice at the great target. (d) When he is finished, he faces north and salutes, and, when he reaches the step, he salutes and descends, with the same observances as when he ascended. (f) Then he takes his rod, fits it in his belt, and goes and stands to the south-west of where the tally- holder is to be placed, with his face to the east.